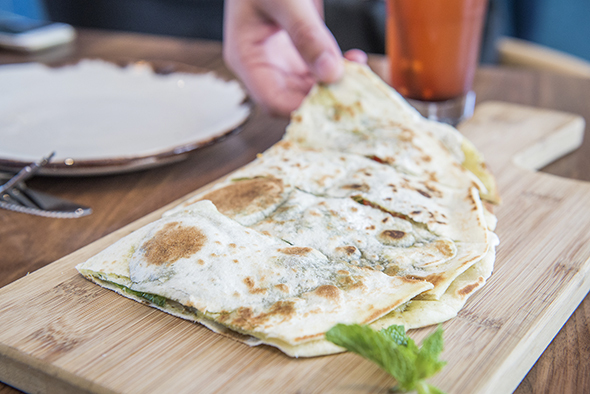 Souk Tabule is part of a family of several Tabule locations throughout Toronto serving high end Middle Eastern food. Souk means "market" in Arabic, indicating the fast casual concept behind this part market, part bakery and cafe, part brunch and quick lunch restaurant. 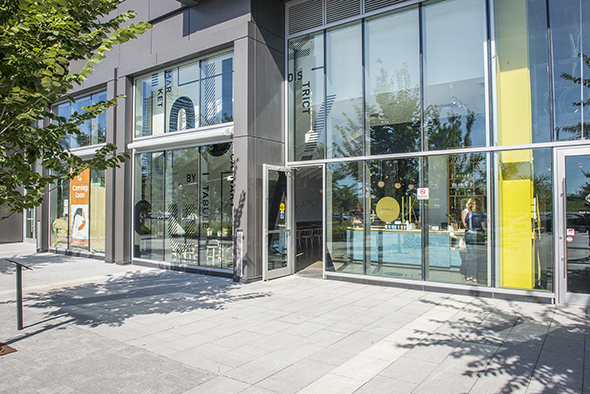 This means those in the Canary District can have a brief or long meal with friends, or pick up coffee and a pastry or ingredients for dinner at a quick pace. They sell their own special blends of spices like zaatar and little jars of the sumac and turmeric they use themselves, and cookbooks. 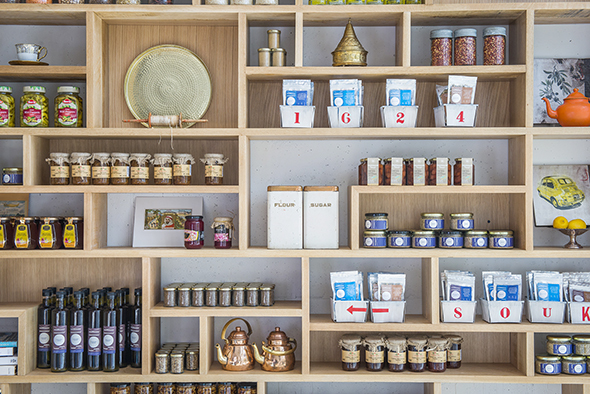 In the front section of the restaurant there are also other special ingredients imported from Lebanon, like fig preserves, pickled peppers, and rose water. You can also pick up a package of the premium loose leaf tea made for them by Pluck , like their ginger cinnamon. Visible at the centre of the restaurant near the ordering counter is the formidable and entertaining saj oven imported from Lebanon. 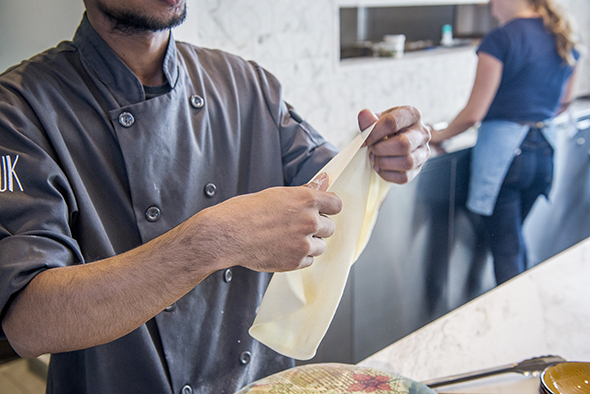 They make their saj bread in house, stretching the dough over a special pillow and then slapping it down on the domed oven, creating a bubbly texture. 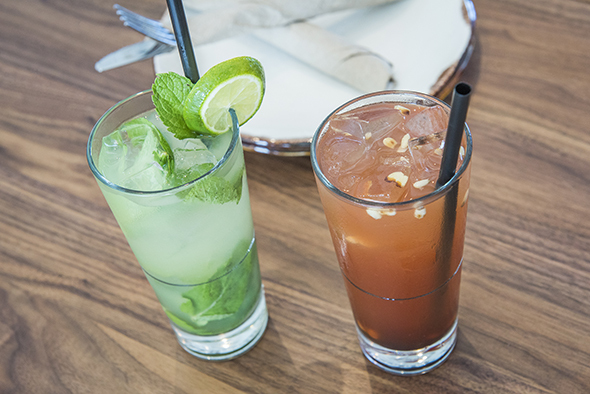 For drinks we grab a refreshing jalab lemonade and a mint lemon-limeade. Jalab is a date molasses made with rosewater, and that lemonade includes some raisins and pine nuts. All drinks available go for $3 - $5.50. Their saj pita is delicate and simple, just saj bread spread with zaatar and lebneh (a Middle Eastern yogurt), scattered with halved cherry tomatoes and mint leaves and folded in half. 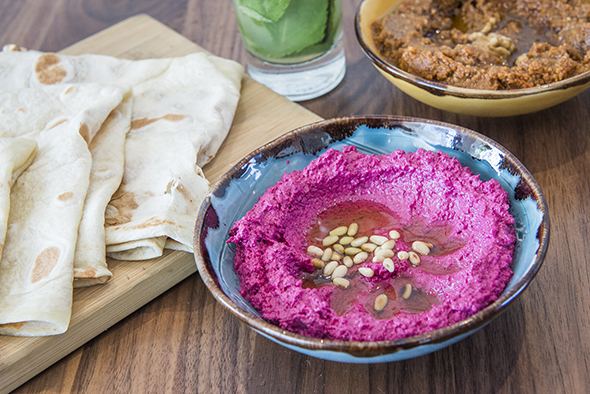 Dip it into muhamara ($6.50), a paste of roasted pepper, walnut, spices, and aleppo pepper; or beet mutable ($6), a dip like tahini but made with beets. The full souk is a reasonable $14 for what feels like a trip to another land. 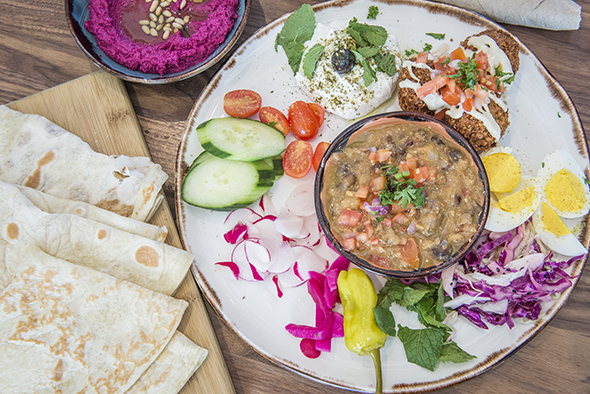 This platter consists of falafel, hard boiled egg, cucumber, radish, hot peppers, a generous dollop of lebneh, slaw and a central fava bean dip slow cooked in a traditional pot called a "full." 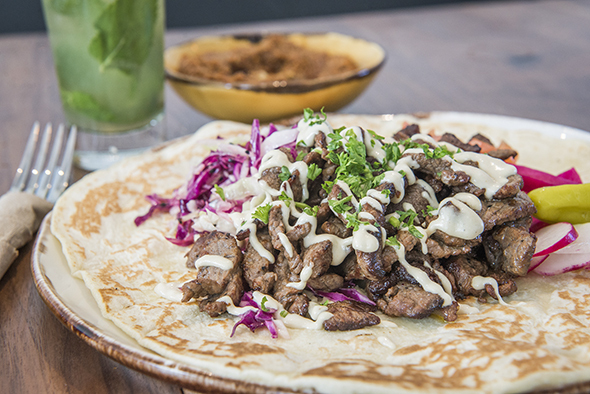 Something else you'll only find served at this Souk location of Tabule is the open-faced beef shawarma, $9 and topped with slaw, tahini, parsley, tomato, pickles, hot pepper and radish. 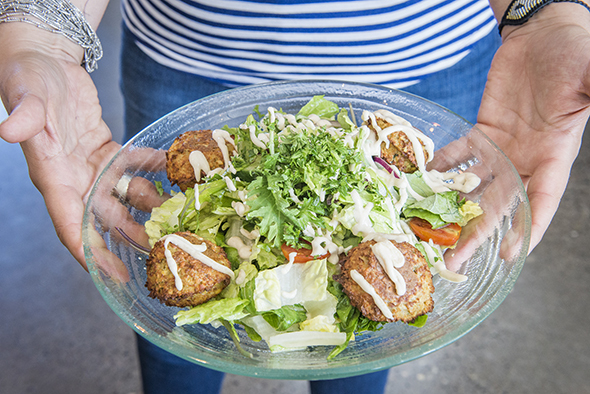 The canary salad ($14) looks like a great lunch option that ups the health quotient of a falafel choice, even baking the falafel instead of frying it. 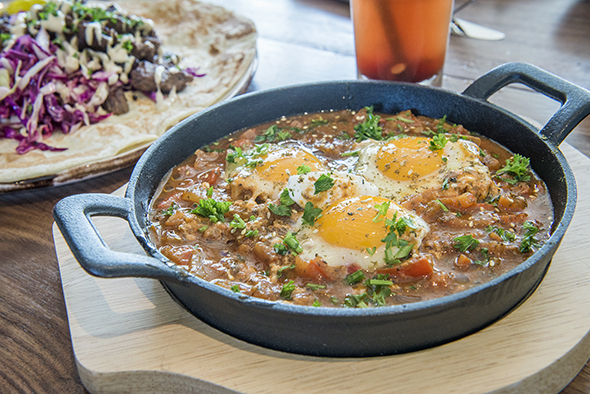 Don't miss the molten shakshuka ($11), a Lebanese brunch of stewed tomatoes, eggs and peppers all baked into a pan. 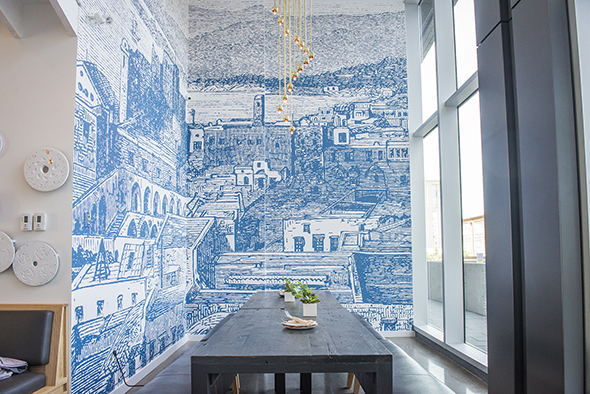 At the back of the restaurant there's a more quiet area with a large table that features a beautiful vintage chandelier and a portrait of Beirut in 1890, touches by Commute Design , who also did Tabule's Queen location .